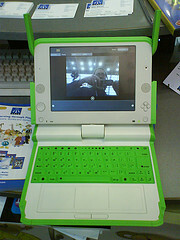 Recently I was reading an article in Computerworld about Richard Stallman and his zeal for open source computing, and happened across RMS's disgust towards the OLPC project making it possible for Microsoft Windows XP to run on that platform. Operating system and tools preferences as a political statement is interesting, but not the point of this posting. The fact that Stallman was using the XO-1 laptop as his portable of choice at one point was most interesting factor to me. I spent some time surfing through the XO Wiki to find out more information and ran across a full Livebackup ISO file that I could load onto my current laptop to try out the user interface. After about half an hour I was sold. I was already in the market for a smaller laptop for travel, so it was off to eBay to see what was available. After a few days of bidding and losing, I found a nice XO-1 in Washington D.C. for about $200. I know, I know, for $300 I could get a brand new ASUS EEE PC with twice the memory, twice the flash and I could run Windows on it. That's not the point. So, I get this unit in the mail yesterday. Right out of the box it is on my home Wi-Fi. It has the feeling of the fun I had the first time I got my hands on an Apple ][. I'll follow up with my experiences.